Entergently: 7 Weeks Old and Already Potty Trained!!! I know, you are thinking . . . Does that say 7 wks old and potty trained? OK not really, LOL!! But Thrace definitely knows when he has to go! I have done Elimination Communication (aka. EC) with all of my babies. I didn't start with Xian till he was 9mo, though I knew about it before he was born (still kicking myself for not doing it sooner with him). There was information about EC on the web back in 2000, but there is even more now!! He was 'potty independent' at 24 mo. With Piper I started at 6 wks. It was like a light bulb moment when I realized that some of the fussing that she was doing was because she needed to pee . . . I mean when I realized it was just SO obvious (and here I was thinking that she was needing to be burped or something). She was completely independent (telling me every time she had to go, no more accidents) at 17mo. I started with the last 3 kids from birth. Arah 'graduated' at around 22mo and Ever around 24. 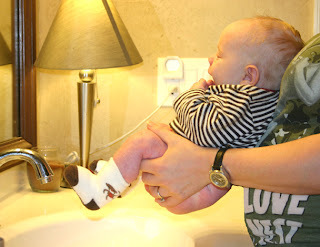 It never ceases to amaze me when I take a newborn to the sink (holding them over the sink is easier on my back than holding them over the potty) and make the cue sound . . ."psssss" . . . . (this kind of just lets them know that they can go) and then seeing them actually responding and going to the potty. I mean you would think that it would be old hat by now but it isn't, it is just amazing that these little people, who can't even talk, can communicate their desire to go and actually hold it for a short time while they wait for me to get my act together and realize what they want and take them to the potty!!! I usually start slow. For the first few weeks I only take them potty when I am changing their diapers (and they almost always go). Then as they get older I start leaving the diaper off or the cover off (we use cloth) and taking them more often. By a few months old I don't use diapers much around the house (and yes, I get peed on from time to time) and by 6mo I typically switch to waterproof training pants (EC pants I call them, from the EC Store) while we are out. Anyway, the point of my post is that for the past 2 days, Thrace (as seen in the photo at top) has been VERY adamant about letting me know he has to go. We have gone ALL DAY both days in the same diaper . . . meaning that yes, at 7 wks old, he has told me that he has to potty, and held it for me to take him, all day for 2 days in a row with no 'misses' (meaning I haven't missed his 'cues'). This doesn't count night time of course. When we go out or if I am really busy I am not quite as attentive, and I can't always take him to potty every 1/2 hr (which is how often he has to go at this age when he is awake . . . though while sleeping he will hold it for a couple hours). But the last 2 days I have been paying attention and able to take him when he needs to go. We have gone 12 hrs each day with a dry diaper! Oh wait, I forgot, we did go out! We took the kids to a movie. I took him to potty at home before we left, he nursed through most of the movie, I didn't go to change his diaper till we got back to the car and it was DRY!! So I promptly held him over the little potty in the car and he went! Just SO cool! OK yes, I'll admit it . . . I think baby pooping and peeing is cool!! With EC things don't always go so smoothly. They go through stages where they are more interested in crawling or walking than letting you know they have to go. They will go through little strikes or just go in their pants because they don't want to stop playing (or they just don't care). Each of the kids has been different. But the key is knowing that they CAN and DO communicate this need with us, and respecting and listening and communicating back with them. I always tell people it isn't about how many pees I 'catch' or miss, it is about the communication. I am telling ya, since starting EC with my first at 9mo . . . I feel like I know them better and knowing that they can communicate their need to eliminate . . . it isn't something I can ignore ya know. Now that's a happy EC'd baby!! Kelley. I love your new blog. You really have a way of expressing your thoughts that are both entertaining and INFORMATIVE. Keep up the good work! Now . . . we just need to get all the Kozy peeps signed on to read your words of wit and wisdom. LuvU! So far none of my kids has 'tolerated' EC at night. I have tried to pee them at night and they just scream. Do you co-sleep? That makes it easier for sure. If so . . . could you signal her to pee and then tell her you will change her in the morning? (though if you are like me, you probably can't in good conscious let her sit in a wet diaper all night). Another idea is just to have her lie naked on a prefold and then you can signal her to pee, slip the wet prefold out from under her and slip a dry one under her. That way it isn't too much effort from you (like having to hold her over the potty) but she is still able to go when she needs to. When she gets a bit older she will probably hold it all night. They usually do most of their peeing in the morning just after they wake, though I am so slow at getting up I often miss them all, LOL! !